Queen Elizabeth II of the United Kingdom has a famously vast collection of brooches, including many classic pieces set with diamonds and pearls. Over the past three decades, though, one of these pearl and diamond brooches has become a steady favorite: the Pearl Triangle Brooch. 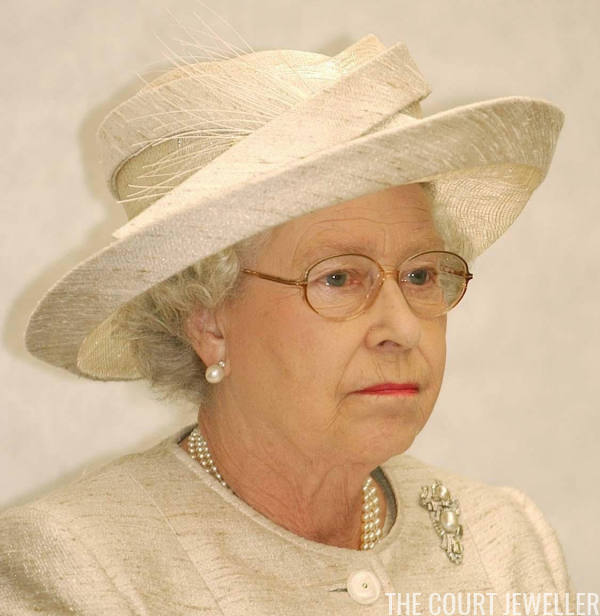 We don't know a whole lot about the provenance of the brooch. The name generally used for the piece comes from its description by Leslie Field in The Queen's Jewels: "an unusual long narrow diamond triangle with two pearls and a canary yellow diamond set in the middle." 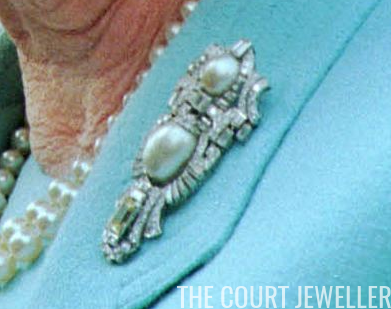 The yellow diamond can be seen at the bottom of the brooch. The overall design of the brooch suggests an early twentieth-century construction date to me -- its geometric lines are reminiscent of the Art Deco period -- but we haven't had confirmation of its maker or its creation date. 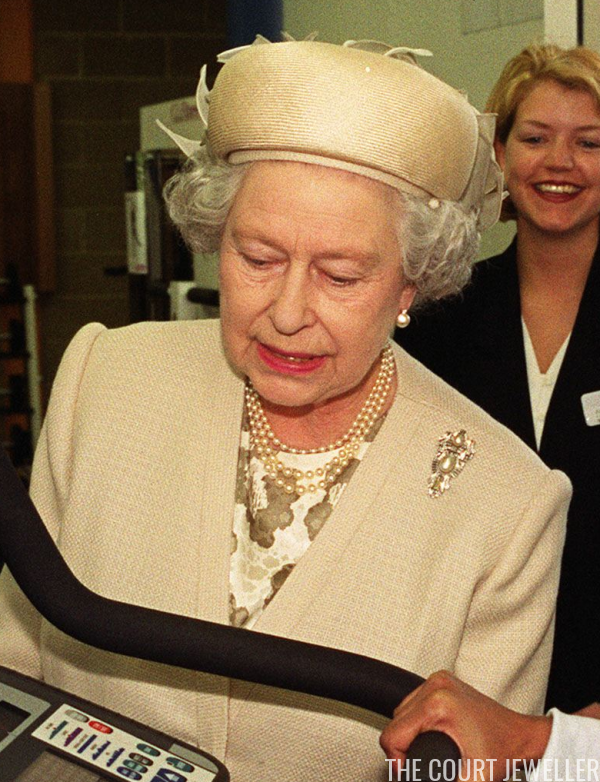 We don't even appear to know how it arrived in the Queen's jewelry box! Good close-up views of this brooch are difficult to come by -- the intricate details of the diamond design seem to be tough to photograph on a moving wearer. But in this image, you get a good idea of the size and shape of the pearls, and you can also see the yellow color of the bottom diamond -- something that's difficult to detect in many images. 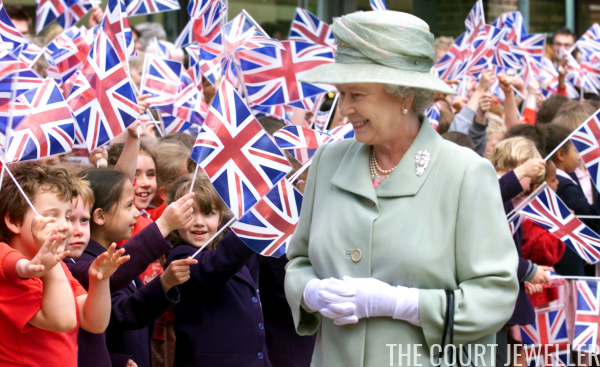 Often, the Queen reserves various brooches to be worn with specific colors, but she has worn the Pearl Triangle with clothing in nearly every color of the rainbow. In 2003, she paired it with a textured cream ensemble for a visit to the Imperial War Museum. 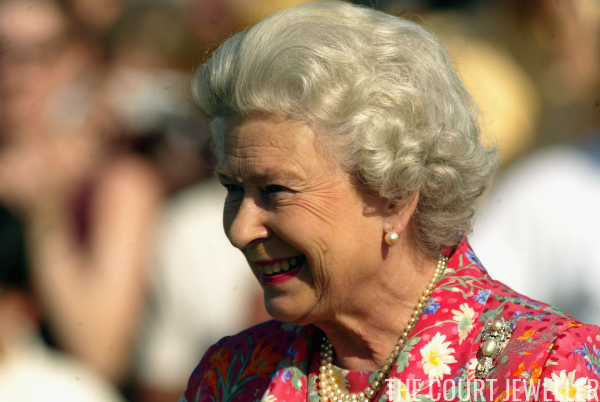 The brooch stood out against the Queen's peachy jacket and dress as she watched a polo match in Windsor in 2000. 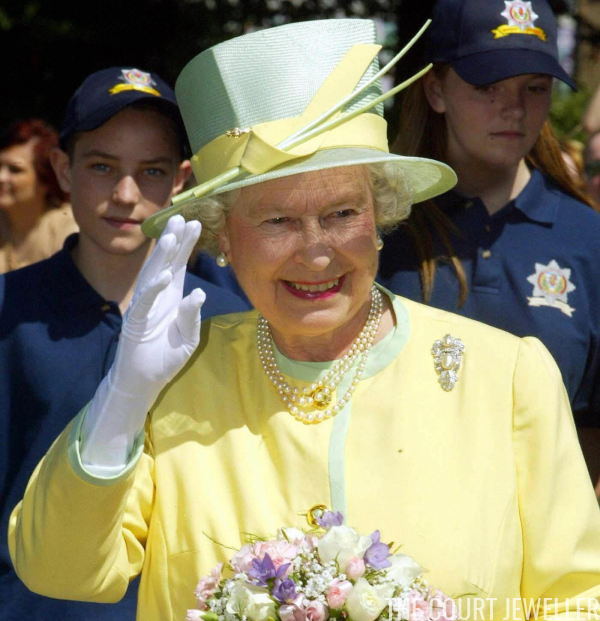 In 2003, the brooch managed to hold its own against this yellow and mint ensemble in Scotland. The buttery yellow highlighted the creaminess of the brooch's pearls and the unusual yellow hue of its largest diamond. 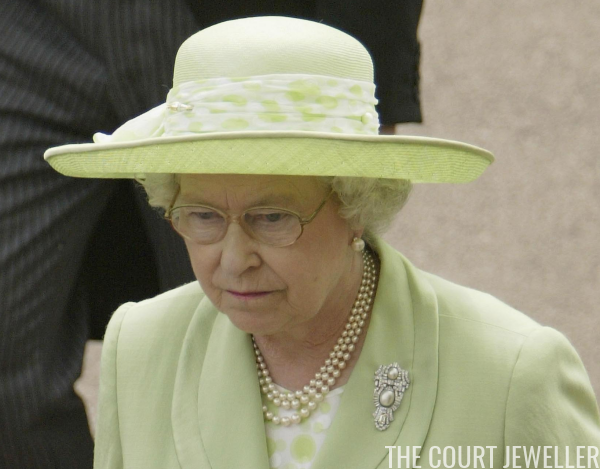 The details of the brooch's diamond design jumped out when paired with this springy green coat at Royal Ascot in June 2003. 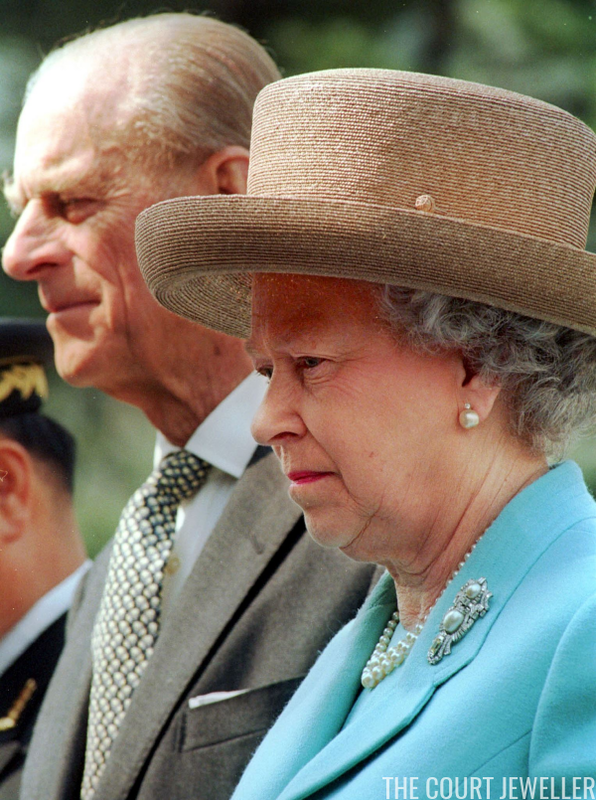 The pearls and diamonds were also beautiful against this blue ensemble, worn in South Korea in 1999 for a visit to the monument for unknown soldiers who died in the Korean War. The Queen has even pinned the brooch to clothing with bright patterns and colors, like this floral outfit from the Hildon Queen's Cup Final at the Guards Polo Club in 2004. 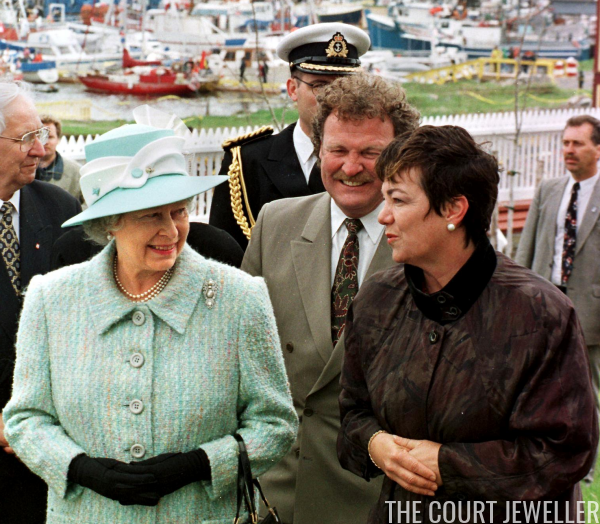 The brooch has also accompanied the Queen on foreign and Commonwealth tours, including her ten-day visit to Canada in the summer of 1997, where she participated in the 500th anniversary celebrations of the landing of explorer John Cabot. 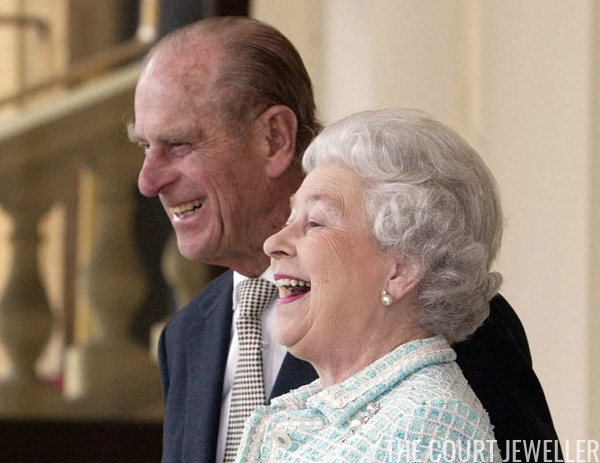 The Queen has also chosen the brooch for diplomatic occasions at home. In May 2004, for example, she wore the brooch at Buckingham Palace for the final farewell event of the state visit from President and First Lady Kwasniewski of Poland. 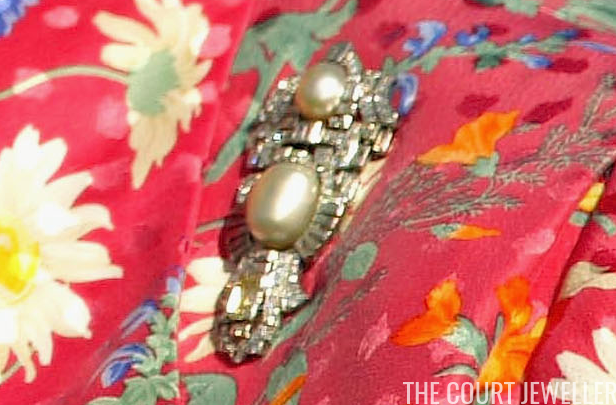 The brooch is still a regular part of her jewelry rotation. 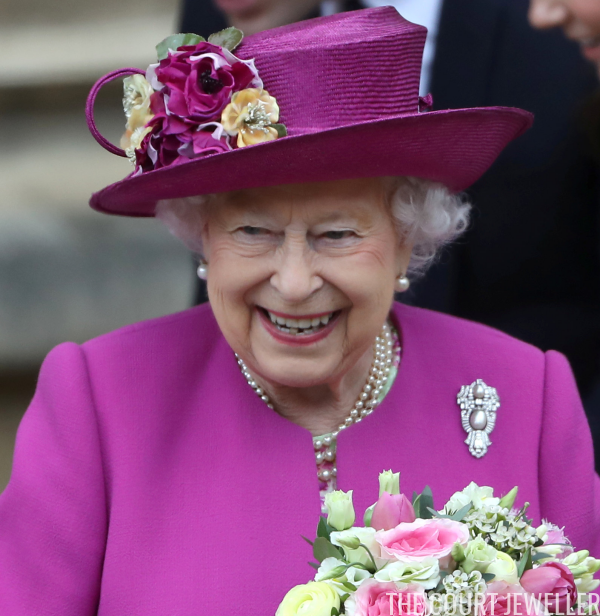 One of its most recent appearances came in April 2018, when she wore the brooch with a vivid violet coat for Easter Sunday services at St. George's Chapel, Windsor Castle. But the most famous appearance of the brooch will probably always be the Queen's walkabout outside St. James's Palace on the day before the funeral of Diana, Princess of Wales. Although it includes some major gemstones, the design of the brooch is just as appropriate for a wearer in mourning as it is for occasions of celebration. 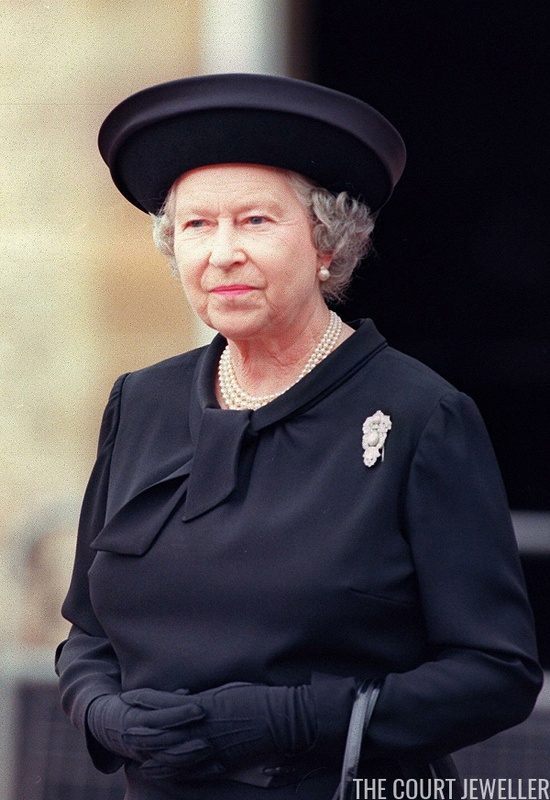 With public approval of the monarchy waning during the tumultuous week following Diana's death, this appearance from the Queen, including her familiar clothing and jewelry, played a major role in calming and soothing her grieving people. 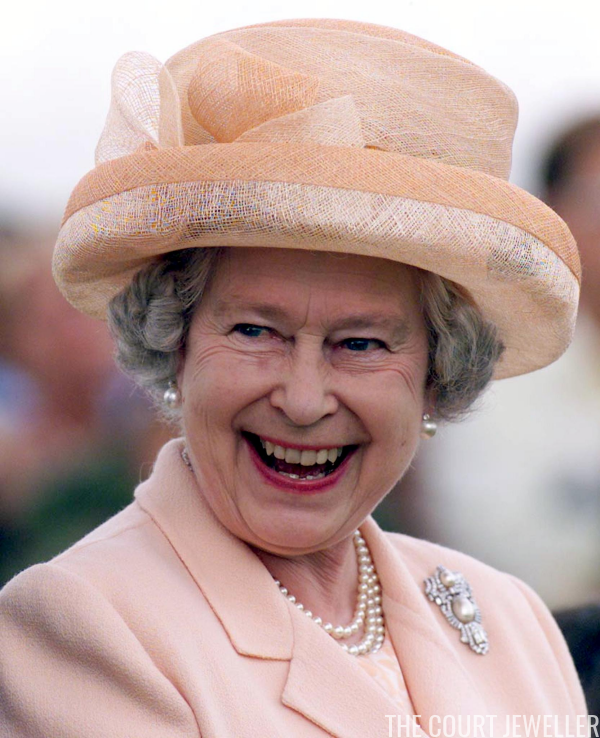 You'll probably remember the brooch from her landmark televised address to the nation, during which she reminded us all that she is both a monarch and a grandmother -- a sovereign and a member of the family.